While most people from East to West, North to South rooted for American Pharoah to win the Triple Crown and then to keep on winning, I’ve been rooting decidedly against him. I bet against him in the Derby, which I went to, and in the Preakness. I quit trying to beat him in the Belmont, but I would have bet against him in yesterday’s Travers Stakes at Saratoga Race Course because one of his competitors, Texas Red, had been my sentimental favorite since last spring. Unfortunately, Texas Red got injured and missed the Triple Crown races. But I’m sure you’re curious: Why would I be so strongly against American Pharoah, the first Triple Crown winner since Affirmed in 1978? It has nothing to do with the horse. The horse I like. Nothing to do with the owner, Ahmed Zayat, and nothing to do with the jockey, Victor Espinoza. For me, it’s all about the trainer, Bob Baffert, with whom I had a brief and unpleasant meeting several years ago. I am acquainted with Joe Drape, turf writer for The New York Times. Joe’s from Kansas City, and I have been friends with his sister, Mary Ann, for many years. That particular year, I think it was 2010, Joe invited me to come out to the Churchill Downs backside (the barn area of the track, across from the grandstand and clubhouse) one morning a few days before the Derby and watch the Derby horses work out. I met Joe at his hotel and we drove out to the track together. Joe was working, and after the Derby horses had galloped, I tagged along with Joe as he interviewed some trainers in the barn area. So there was Baffert, in jeans and a long-sleeved dress shirt, as I recall, with his shock of white hair and trademark sunglasses. Before starting the interview, Joe introduced us, and we shook hands. I then stood by as Joe asked Baffert several questions. As the interview was winding down, it occurred to me that I might slide in a question. With that, he turned on his heel and walked away, not saying another word. …Since that moment, as you might imagine, I have not been a fan of Bob Baffert. In my opinion, he’s a jerk. 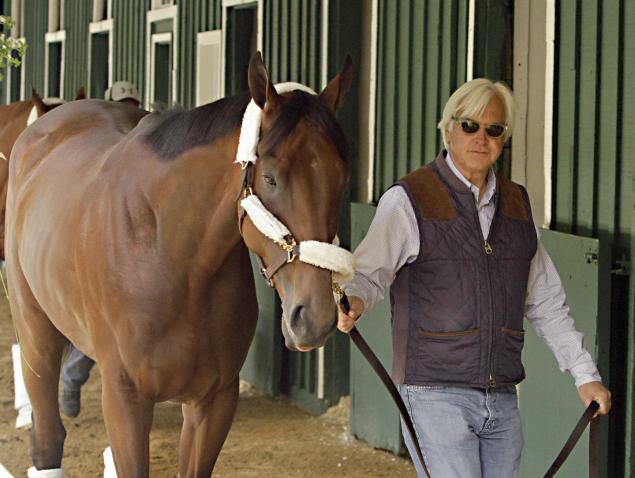 He’s a great trainer, undeniably, but I will never bet on a Baffert-trained horse again. That’s why I watched the Travers yesterday with more than passing interest. I was rooting for Texas Red, but what I really wanted was for any horse in the field to beat American Pharoah. Soon after the horses left the starting gate, Frosted, one of the horses Pharoah beat in the Derby and Belmont, began pressing Pharoah, who was on the lead. Frosted kept the pressure on Pharoah all the way around the track and took a slim lead as the horses rounded the home turn and came into the stretch. I was on my feet in my living room, screaming and cheering for Frosted. Part way down the stretch Pharoah edged out in front, and it was clear Frosted would not come back to catch him. However, Frosted’s all-out challenge had taken a lot out of Pharoah, too, and down the middle of the track charged a horse named Keen Ice, who had gone off at odds of 16 to 1 and also had lost to Pharoah in the Derby and Belmont. About a hundred yards before they hit the wire, Keen Ice passed Pharoah and drew clear. I felt like 220 volts of electricity had surged through me. Later, I replayed the race for my daughter, who had been out, and once again I jumped out of my chair as Keen Ice passed the Triple Crown champion. A minute or so later, a camera focused on Baffert’s wife, Jill, a beautiful blond. She was crying. Her tears didn’t move me a bit. You have a hard Heart! Not American Pharoah his trainer is jerk! Not American Pharoah fault ! I hate doing this on my cell phone! Mission Control to Bob…Come in, Bob. Too bad such an amazing horse has to be saddled (sorry, I couldn’t resist) with such a disagreeable a-hole. The sooner he’s put out to stud (AP, not Baffert), the better. You DO have a hard heart. If she was homely, I might have felt a tinge of regret. Late to the party, but the guy could have just been having a bad day, or you just asked the wrong question. Don’t follow the horse racing circuit, so not sure what the etiquette is in the stables. I was a pit crew mechanic in the NASCAR Winston Short Track Series for 8 seasons at Lakeside and I-70 Speedways (crew chief the last 3 years) in the late ’90’s and early ’00’s, before they ruined NASCAR. If you would have come down to the pits and asked me what I thought of some other teams car, I probably would have answered the same, verbatim. I probably wouldn’t have walked away though. The thing about racing is, (and I’m sure it’s probably the same with horse racing) you worry about your team and how to make it the best. If your running once or even twice a week, you have very little time to worry about what the other team has going on. Your focus is putting out your best on race day. That being said, rather than turning on my heel and walking off, I probably would have asked you if you had any questions about my team. The reason you have no empathy for his wife is because she is a “gold digger”. While this is purely assumption on my part, I think the odds are in my favor. I also agree, she deserves no pity. I’ll end with this…your boy Cuthbert is back and having one hell of a night vs. Detroit! Was thinking the same thing about Chesy! Hope he’s had his chicken pox vaccination! Just curious, Jason, why do you say that about a ruined NASCAR? I could write an essay on what’s wrong w/ NASCAR today. Since I don’t have time for that at the moment, I’ll throw out a couple of the major problems. 1. Team owners with multiple drivers. The sport is dominated by the money guys who can tell one of their drivers (who may not be doing so well) to block and sometimes take out other teams drivers, in order for one of their other drivers (who is likely in the points chase) to gain an advantage. 2. The “Chase for the Cup”. What a joke!!! They have changed the criteria for getting into this worthless “play-off scenario” on a yearly basis. The old system lasted decades with no changes. This is stupid. They need to go back to making the Champion the best driver of the season. Not some “shoe in” who won one race to get into the chase. I could go on and on, but time is short today! Thanks, Jason. I figured there was probably no short, simple answer, but appreciate the general overview.